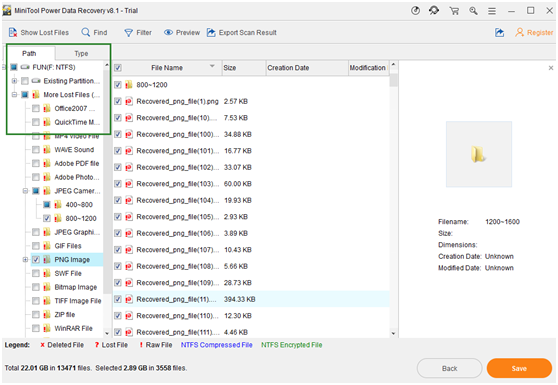 In this article, I want to not only introduce you to MiniTool power data recovery but also show you how to recover lost files from different storage device. It is our number one choice when we face data loss and it will should be yours. No matter who you are, be it an IT technician, student or entrepreneur, maybe you would have faced data loss at least once. Being an IT technician, I face it at least once or twice a week. In the past year in 2018, data loss has cost the industry billions and this number is growing. As can be seen, using a right data recovery software can save you or your company from a disaster. MiniTool produces a note worthy collection of data utilities. The most useful one being their data recovery offering, named MiniTool Power Data Recovery, it is a free and read-only data recovery software can help to recover deleted, formatted or lost data easily and quickly. 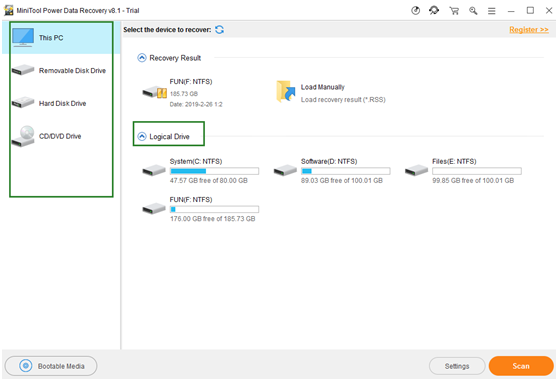 Not only can you recover files from hard drives with MiniTool power data recovery , but also from hard drive, SSD, USB, memory card, and other storage devices. It is quick, safe and easy to use. Did you faced the partition becomes RAW or Hard drive is damaged? You can easily recover data from inaccessible hard drive, and recover data from damaged, formatted and RAW drive by MiniTool power data recovery. This tool can handle a lot of accidentally situations. It can be quickly and safely recover mistakenly deleted files by pressing Delete or Shift & Delete buttons, and recover files after emptying Recycle Bin! MiniTool Power Data Recovery can recover lost data after virus attack effectively and quickly and it just only three steps. Not only these, it also has more powerful features. 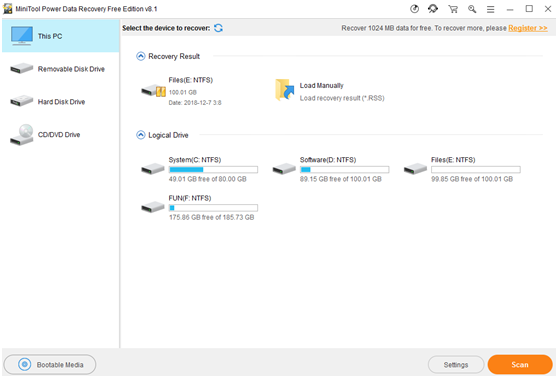 It can be effectively recover data from formatted partition, recover data from accidentally deleted partition, and recover data from lost partition after reinstalling Windows. Now that you know what MiniTool power data recovery can do, we will take a look at it in action. Download MiniTool power data recovery and install it. Launch MiniTool power data recovery, select a location from where you want to recover your data and press the Scan button to start scanning. Alternatively, you can specify a file location from lost partitions to choose. 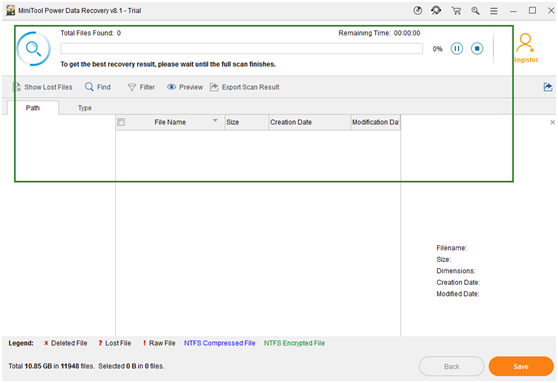 Step 2: MiniTool power data recovery can scan the lost, deleted, RAW files. Also, NTFS compressed and encrypted files are supported. If you only want to recover some certain types of files, you can first press the Settings button and then choose the target data types only from the pop-out window. After that, click on the OK button to go back to the interface. Step 3: The scanning process will cost you a while. Please be patient. You will see the scan result interface where the scanned files are listed by the path after it finishes. Step 4: afterwards, click on the “Save” button and choose a storage path for them from the pop-up window. In the end, you should click on “OK” to complete your selection. I use data recovery software daily and MiniTool power data recovery is one of the best and it is my first choice in any data loss situation. I enjoy its simplicity and power.